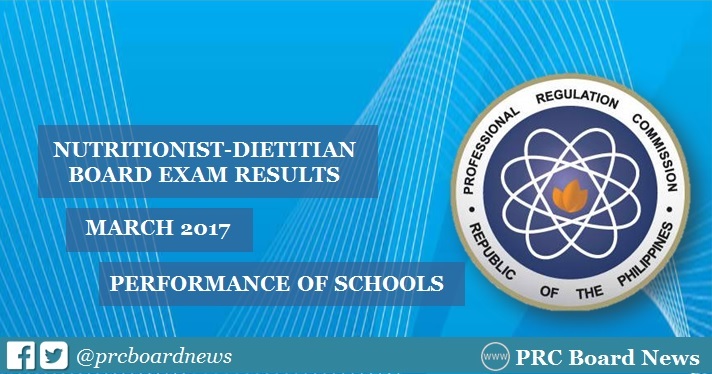 The Professional Regulation Commission (PRC) and the Board of Nutrition and Dietitics released results of March 2017 Nutritionist Dietitian board exam on Monday, March 20 or in 2 working days after the exam. As expected, the University of the Philippines - Los Banos (UPLB) clinched the top spot anew garnering 100% passing rate or all 95 takers passed. University of Santo Tomas (UST) tied with UPLB, with 88 examinees passed. PRC administered the licensure exam on March 15 and 16 in the cities of Manila, Baguio, Cebu, Davao and Zamboanga. Check out the list of top performing schools as recognized by PRC per Commission Resolution No. 2010-547 series of 2010: WITH 50 OR MORE EXAMINEES AND WITH AT LEAST 80% PASSING PERCENTAGE. For the past three years, University of the Philippines Los Baños (UPLB) has dominated the licensure exam with 100% passing rate. Do you think UPLB will continue its dominance in the Nutritionist Dietitian board exam?